We all knew this season was coming. It seems like only yesterday we were riding around in shorts and cranking up the AC, but here we are in December already, and that means cold-weather bicycling is on everyone’s minds. Right about now, some of you are probably thinking, “Why on earth would I want to ride my bike in the winter?” In fact, the winter isn’t all gray skies and gloom, and the best way to learn that is to get out there and see it. If you’re at all troubled by Seasonal Affective Disorder (and really, who doesn’t feel a little down when it’s cold and dark for so long), then winter riding can be a great way to get some sunshine on your face and get the blood pumping. Plus, you get to stay active during the calorie-filled holiday season! To top it off, the reduction in bike traffic means you have those lanes and trails mostly to yourself. Here are WABA’s helpful tips to face the winter head-on and stay warm, happy and safe. Reflective clothing – These days, you can find reflective material on all sorts of gear, from gloves to shoes to jackets to pants. Even if you don’t want to go the full reflective vest route, a few points of reflectiveness on your arms and legs (your moving parts) will make a big difference in how quickly drivers can spot you. Don’t look now, but WABA sells a fantastic reflective pant cuff! Light it up – Cars can only avoid you if they can see you, and driver visibility is reduced in rain, snow, sleet and fog. So use extra lights and make sure they are on the “blink” setting–they will attract more attention than solid lights. Ride visibly – When you control the lane, you make sure that you are in the most visible place on the roadway. Remember, visibility is your top priority! Know where to ride – Specifically, get to know which roads have good ambient light available and which do not. Ride smart and err on the side of caution–just because you can see them does not mean that they can see you! Pedal smoothly – Try to maintain a steady pace, but you don’t want to go too fast if conditions are bad. Watch out for the rear tire slipping when you start from a standing stop. Brake OR turn, NOT both – Start braking early and shed a lot of speed before you start turning. When turning, try to keep pedaling smoothly and your weight centered over the bike. Keep your eyes up and focused about 100 yards ahead of you, along the line you will take when you finish the turn. This will help you keep both your body and the bike where you want them. Feather your brakes – Wet, cold rubber is not as effective at stopping you than dry, warm rubber. Tap your brakes lightly before you need them to dry them off slightly. Not all snow is created equal – Dry powder is easy to ride through, but can cake on your rims, brake pads, etc. Wet snow is hard work to ride through, but if you’re heavy enough, you can cut right down to the pavement. Ice can be hard to spot, unpredictable and may be best avoided if you can. Packed snow behaves like ice when it’s cold out and like a combination of ice and wet snow when it’s warm. You will learn to recognize these types and the gradations between them pretty quickly. Caution, roadway narrows – Winter Bike Law #1: When there’s snow on the ground, plows will deposit it in bike facilities. Don’t expect anything other than main roads to be plowed, and don’t even expect those to be well-plowed. Take the lane. Oddly, drivers are often more respectful of cyclists in the winter. Not everyone knows what they’re doing – Also, don’t expect drivers to be experienced at winter driving. Do your best to be predictable so drivers don’t have to react to you. Follow the laws and communicate with them through hand gestures and eye contact. Again, err on the side of caution! Watch for metal and paint – They get very slippery when wet. This means manhole covers, metal bridge surfaces, grates, metal construction plates, crosswalks, stop lines, bike lane markings, etc. Think about lower tire pressure – Most tires have a range of acceptable tire pressure (85-95 psi, for instance). On the lower end of that range (or even below it), you will get better traction out of your tires. Just beware that your chances of a pinch flat go up when your tires are under-pressurized. Be ready for extra maintenance – Winter riding puts different kinds of wear and tear on your bike. 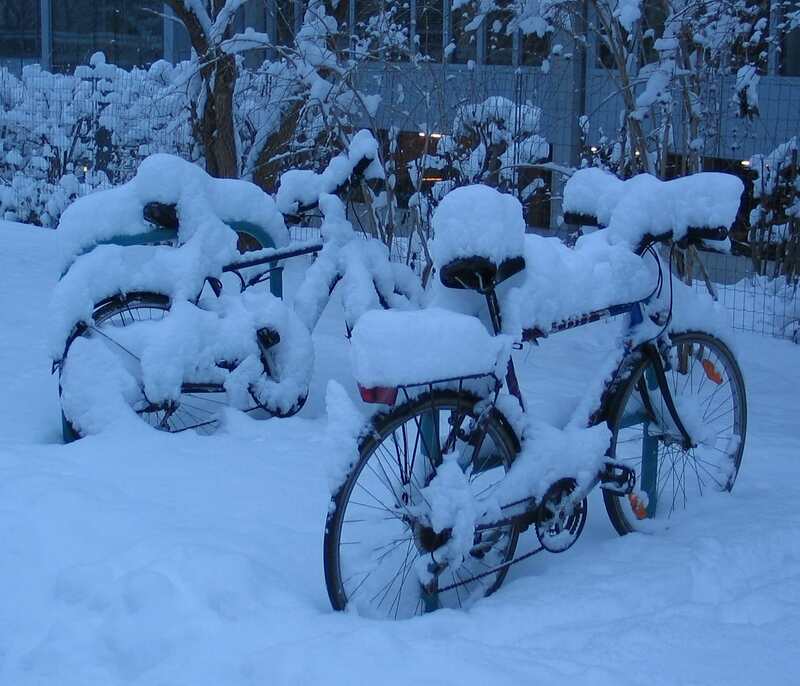 Extremely cold temperatures can make your tires, chain, brakes and any parts with bearings (hubs, headset, pedals & bottom bracket) behave differently, so keep an eye or ear open for anything abnormal. Consider a tune-up before winter really begins and again after it’s over. At the “before” tune-up, ask the bike tech for some all-weather chain lube and wet weather brake pads. Oh, and the cold will also drain the batteries in your lights faster! Remember folks, practice makes perfect! If you’re at all unsure of your winter riding skills, wait for a snowy/sleety/rainy/freezing day and head out to a parking lot and practice for a while. Get the hang of starting, stopping and turning. That way, you’ll be prepared for whatever January and February throw our way. Topics: Uncategorized. Tags: commuting, education, lights, news, tips, winter.